Happy and his Pappy ran in the short-lived Sunday pre-print section offered by an outfit called Syndicated Features. However, if you come from the comic-book world, you might be thinking, "Naw, ya can't fool me. That strip ran in Best Comics and Startling Comics in the early 1940s". Well, you're right, but I have to play the trump card and tell you that my Happy and his Pappy beats you by four years or more, and the strips you find in those comic books are merely reprints of an honest to goodness newspaper strip. And that's true not just of Happy and his Pappy, but all the Syndicated Features strips, which found their way en masse into comic books well after their newspaper careers fizzled. Syndicated Features is a mystery itself. If you run it around the interweb search engines, you'll see any number of folks claiming that it was a newspaper syndication arm of the Eisner and Iger shop. To that I have to say, in my most conciliatory voice, sorry but no. Definitely not. The creators featured in the Syndicated Features comic section were not in the same (lowly) league as those fresh out of art school kids to whom Eisner & Iger were paying a pittance. In fact, not one of the creators at Syndicated Features has any tenuous connection to Eisner and Iger. But what, then, is the deal with Syndicated Features? They came out of nowhere to produce and market a nice little quality tabloid section of weekly color comics in 1936. They managed to attract some creators of note (granted, C-level cartooning celebrities), so they were not completely averse to spending money for professional material. And yet they made the same simple mistake that others did. They marketed a color comic section to small weekly papers. As is the standard result of such marketing, they got some clients to sign up at first, on a free, trial or print-now-pay-later basis, and when it came time to pay the piper, the newspapers bailed. It really is amazing how many companies tried the same fatally flawed approach. 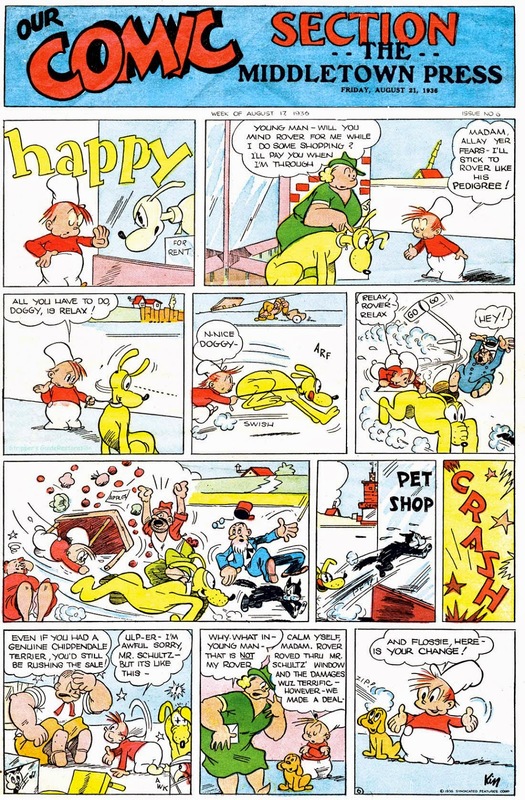 So Syndicated Features' comic section, of which Happy and his Pappy was usually the front page feature, crashed and burned after a mere eight months. Now that we have the big picture out of the way, let's talk about Happy and his Pappy. The feature about a wacky father and some team was original titled just Happy when it debuted in the first issue of the tabloid on July 13 1936. Dad got co-billing starting with the October 26 issue. The strip is a little reminiscent of Milt Gross' That's My Pop, all except that the creator Kin, while not a bad writer, was no Milt Gross. 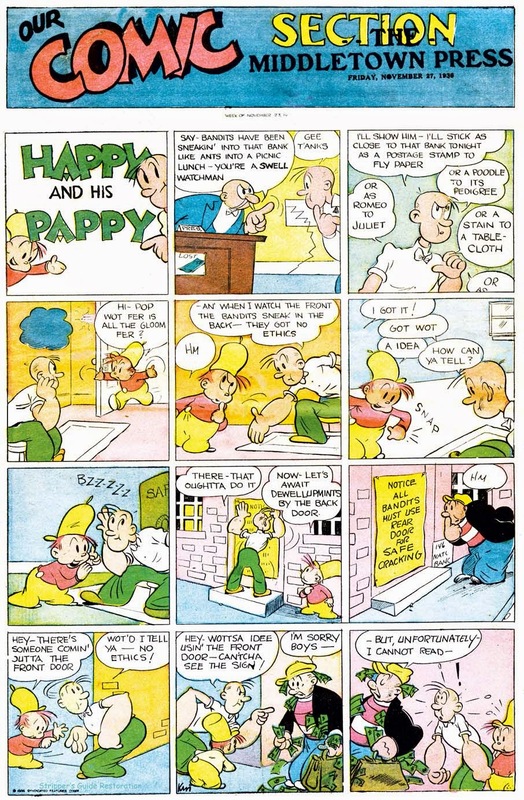 Some comics historians have the opinion that 'Kin' of Happy and his Pappy is Kin Platt, who took over Mr. and Mrs. in 1948. I'm a little skeptical of that, as the art style of this Kin doesn't seem to me to bear much resemblance to that Kin. Dissenting opinions are welcomed in the comments! In the next couple weeks we will cover each of the Syndicated Features strips, along with Ink-Slinger Profiles for many of the creators. Alex Jay will weigh in at the end of this series with some information he has uncovered about Syndicated Features. Ooh, I love this kind of stuff! Looking forward to this coming week's posts.